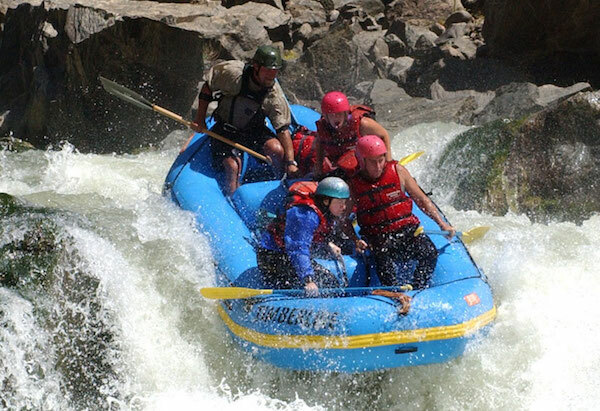 It’s important to know about common whitewater rafting hazards so that you can take precautions to avoid them whether you’re on a commercially guided Vail rafting trip or whether you’re rafting recreationally with friends. 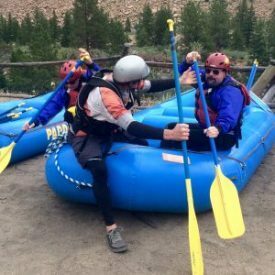 At Timberline Tours, the safety of our guests is top propriety, and our rafting guides have the experience, training, and local knowledge necessary to help avert danger while Colorado rafting. 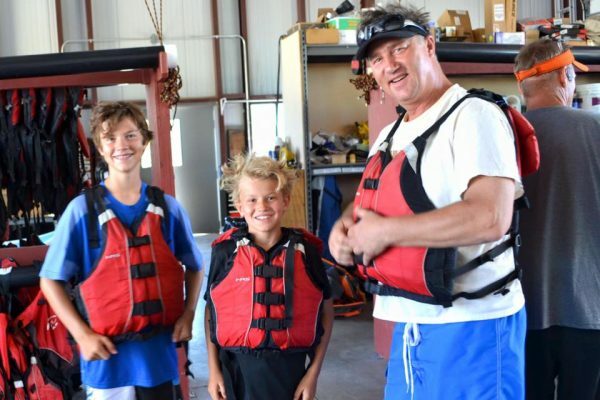 Knowledgeable guests make great partners in adventure, so read on to prepare in advance for a safe day out on the river. Rafting safety starts before you even set foot in a raft. 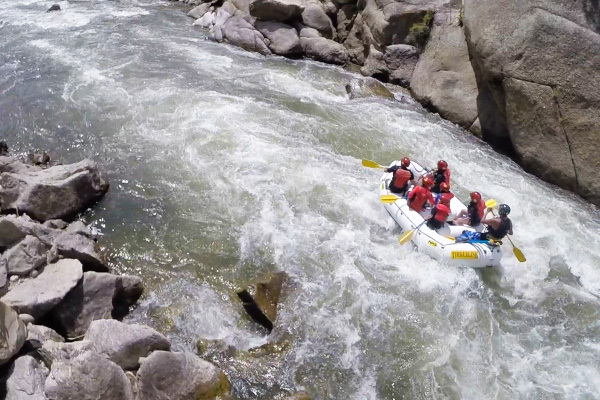 Preview our Vail whitewater rafting trip options carefully, and choose the best fit for your group. Consider fitness levels, desired level of intensity, and the age of each person. Make sure you know how river class ratings work in order to pick an intensity level that’s within reach for everyone in your group. If you’re not sure what type of trip is appropriate for your group, our friendly office staff is happy to consult with you. Please contact us if you have any questions or if you need more rafting trip details. Be sure to show up on time at your trip’s meeting location, and be dressed in appropriate river gear, including river-appropriate footwear (see: “What to Wear Rafting” if you’re unsure). Before each rafting trip, Timberline Tours guides will outfit you with essential rafting gear and go through a pre-trip safety talk. Listen carefully during the safety talk, which covers topics ranging from self-rescue techniques, assisted rescue techniques, common paddling commands, paddling tips, and more. When out on the river, stay alert and react quickly to your guide’s commands. Continue to listen carefully for on-river safety directions, and act swiftly to help rescue any swimmers that may go overboard into the river. When the following whitewater rafting hazards are in the mix, it’s especially important to take precautions and quick action to help protect the safety of each person. Whitewater rafting hazards can be present in any section of river, whether it’s mostly mellow or full of frothy rapids. And even on sections of river that might be considered easy, river hazards can crop up quickly. For this reason, it’s important to have local knowledge of river dangers if you’re rafting recreationally. Or plan to go rafting on a guided trip to ensure that you have a skilled and experienced leader in your raft. A hole is a river feature that forms when whitewater flows over a rock, drop, or other obstruction that results in a recirculating current. Essentially, a hole is formed when this current flows back upon itself in a circular pattern. Some holes can have a powerful downward circulating effect, pulling a person through its cycle or keeping a person underwater for a prolonged period of time. 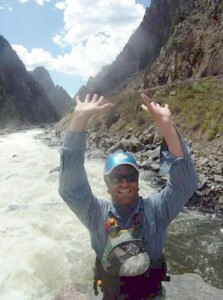 Go rafting with a guide in sections of river that have holes in them to capitalize on local knowledge and skill. A strainer is a river hazard that occurs when a feature, such as a downed tree in a river, constricts water in multiple places as it flows through. A downed tree or even a downed branch that’s lodged in the river becomes a dangerous obstacle that forces water to flow through a net of constricted space. In effect, the current pulls anything on the surface of the water underwater into the strainer. As the current flows through the strainer’s constricted spaces, it gains great power and can potentially pull or trap a person underwater. Research the latest river conditions to avoid known strainers, and steer clear of any trees, branches, or other constricting features when you see them while rafting. Like a strainer, a sieve can be any feature that forces water to flow through a tight space. A sieve can be formed, for example, by rocks that come together in a way that constricts water flow. Sieves can be present underwater, where they’re not visible from the surface. When water is forced to flow from a large to a small space through a sieve, it speeds up and has a suction effect that’s similar to a strainer. Local knowledge is important in avoiding sieves. Know where they exist, and steer clear of them while rafting. Stay safely within the raft, and rescue any swimmers quickly in the area of a sieve to prevent an unsafe situation. An undercut occurs when a cliff or rocky area extends out over the surface of the river. Water can flow beneath the undercut, and the force of the current can trap a person underwater beneath the rocks. Be aware that undercuts can occur in areas where the river comes up against rock walls or cliffs. Know before you go: Take time to gather local knowledge, or go rafting with a guide in areas where undercut hazards are known. To book your Vail, Colorado adventure, call Timberline Tours at (970) 476-1414, or email us at info@timberlinetours.com.